Hilarious comedian and mother of two, Ali Wong, recently appeared on Ellen for some real talk about life with a toddler and new baby; it’s the perfect way to start the day for any mama in need of a laugh! Any mamas in need of a new car seat? Now through May 5, Target will allow you to trade in your old car seat for a 20% discount on a new car seat, booster seat, car seat base, travel system or stroller. More details here! Is your little one a tissue or toilet paper monster? If so, you will love this $12 mom-hack from Jenn Ramirez in Chicago, Illinois! Jenn bought these colorful scarves on Amazon, shoved them into an empty wipes box, and ended her battle with tissue confetti and dried out wipes. She says her two little ones, “love playing with the scarves and even stuff them back in the box on their own so they can pull them out again!” Thanks for the tip Jenn! New Zealand’s Prime Minister, Jacinda Ardern, is the youngest woman in the world to lead a country. Now, she’s pregnant and expecting her first child in June. The Today Show recently did a fantastic profile piece on her that will resonate with a lot of women out there feeling pressured to choose between a career and motherhood. It’s definitely worth a watch if you have a few minutes. BOTTOM LINE: Prime Minister Ardern looks forward to the day when things like her being pregnant no longer make headlines (Amen!) Running a country (or having any high-profile career) shouldn’t automatically exempt women from motherhood and all its glory. We should be supportive of all moms, whether they are running a country, a business or their own household. A Senator, and mom, here in the US made history last week by becoming the first to bring a baby onto the Senate floor for a vote. Senator Tammy Duckworth gave birth to her daughter just ten days prior to her Senate appearance, which also made history. She said she was happy to have the opportunity to do her job as a Senator and mom. BOTTOM LINE: Regardless of your political stance, this woman is AMAZING. Not only did she lose both of her legs and severely injure her arm in combat, she was also awarded the Purple Heart and made history by becoming the first Senator to have a baby while in office. 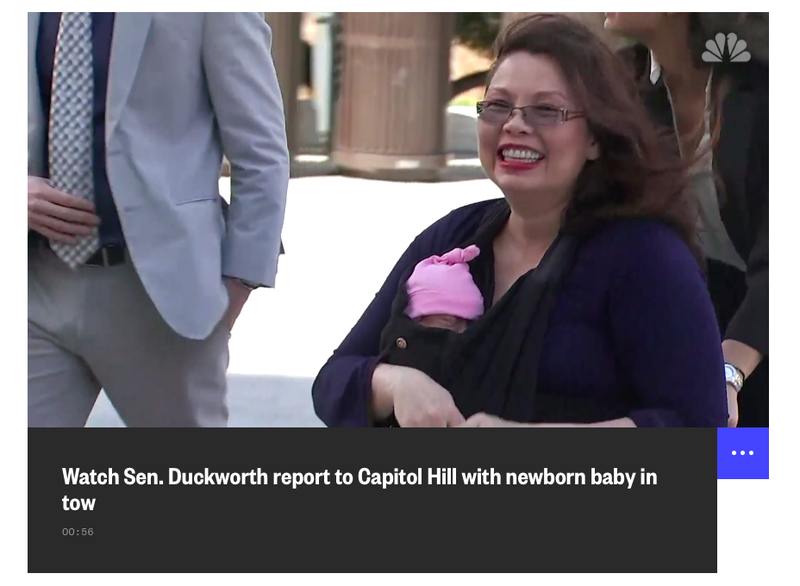 Now, just ten days postpartum, Senator Duckworth shows up for a Senate vote looking fresh as a daisy with her brand new baby in tow! What an inspiration! Anyone struggling to communicate with their 4-year-old dictator or emotional teenager? Clinical psychologist Dr. Wendy Mogel recently stopped by CBS This Morning to talk about her new book, “Voice Lessons for Parents: What to Say, How to Say it, and When to Listen,” and gave some strategies to help us better understand what’s going on inside those little noggins and communicate more effectively with our children. BOTTOM LINE: When it comes to parenting, new and interesting perspectives can sometimes be very helpful. Some of Dr. Mogel’s techniques won’t appeal to everyone, but she gives good direction on things like re-claiming control and taking the emotion out of the tricky parent/teenager dynamic. Here’s yet another example of why moms are so dang awesome! One mama wasn’t going to let a little stage fright stop her daughter from finishing her talent show performance. When 10-year-old Makayla froze up on stage her mom did what moms do best and helped her through it. The video has, no surprise, gone viral and is touching hearts across the country. Grab the tissues for this one. A 6th grader who thought his mom was still deployed overseas recently got the ultimate surprise while eating lunch at school. His reaction will melt your mother-lovin’ heart.